Going about my daily activities today, I was struck by the fact that I noticed STARLINGS in several places around town. Now, I know that these are common birds (estimated 200 million individuals in North America alone, with a range covering most of the continent), but even so, I think I'm almost always attentive to what types of bird I'm seeing about me. That led me to wonder if perhaps they migrate--since in the Arctic & temperate latitudes so many birds this time of year are now making their preparations (if not already en route), which generally involves first a giant "meet up" or flocking. Sibley's Bird Life & Behavior (one of the holy scriptures for North American bird enthusiasts) reports that whether starlings migrate depends on how far north they are, but on this it does not elaborate further. So I posed the question to the local birdwatchers' list. The response? No one knows for sure whether the currently resident population stays, but I'm told there are definitely starlings around here in winter. So it seems likely then, that they do not migrate. I realize starlings are not usually a bird we think of as particularly attractive--besides I was reading about what a threat they pose to less common, cavity-nesting birds, such as woodpeckers (apparently they can be quite aggressive and will evict them). Nonetheless, I have to say in their defense: a few moments' observation of them reminded me of just what a fine and unique plumage they have. I love not only the spots, but those shaggy feathers on the throat and breast with the quality of a feather boa. It's also amazing to contemplate that every single starling in North America today is a descendant of the small population of mere dozens (~60-100) released in Central Park in 1890. (you can find this fact cited everywhere--Sibley, Audubon guide, etc.) How bizarre that apparently the motive for this was to introduce New Yorkers to all of the birds mentioned in the plays of Shakespeare! One Eugene Schieffelin, a member of the Acclimation Society of North America, is responsible. 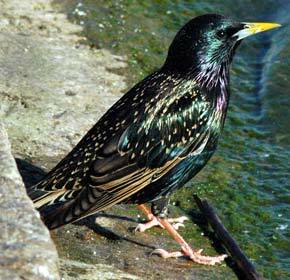 And did you know that starlings are adept at imitating sounds? It's true. They often imitate birds of their surroundings. Perhaps not surprising then to learn that they are closely related to Mynabirds (both are in the "Sturnid" family of songbirds). It's this ability to imitate which led Shakespeare to reference them in his play Henry IV, read the quote here. UPDATE: Perhaps I should add that starlings are notoriously gregarious. A fellow birdwatcher informs me that they are the birds that lately can be seen in the evenings congregating by the hundreds on telephone wires and powerlines before going off to roost. Here is amazing video proof of just how gregarious they can be--you don't want to miss this!